There are many advantages of becoming a truck driver. Some of those advantages however have side of affects which are disadvantages for others. Take what is stated and apply it to your unique situation to make sure the advantages listed are not cancelled out by its negative side effects. This will depend on your specific situation. Think about how much money you spend driving to work each day at a 9 to 5! That is just one trucking job advantage but it can be huge these days. For anyone living in rural or inner city or who doesn't get a chance to travel, trucking can be a huge plus for you to get out and see the country! AND get paid! Crazy. For more details about advantages of trucking jobs follow the links. Again, you will need to pay attention to the details to better determine how to take advantage of the pros of the trucking lifestyle. You will have to determine if they are relevant to your situation or actually a con for you. It is important to understand that find this in a trucking job will vary from company to company. As a new trucker driver you will likely be over the road but your trucking company could specialize in certain parts of the country and not go to other areas much. So as you can see, the title could be misleading if you assume that at all trucking companies this traveling to new places and having extra free time is equal. Also, you don't always have time to actually spend time at each place you want to at the time that you want when out on the road. However, you can plan sometimes and make it happen. For me the best part of trucking was discovering and exploring unknown small towns and beautiful places mostly in passing. But I did plan and stop in some wonderful places. For you lazy drivers, don't let this scare you. Most trucking companies don't require you to load or unload. 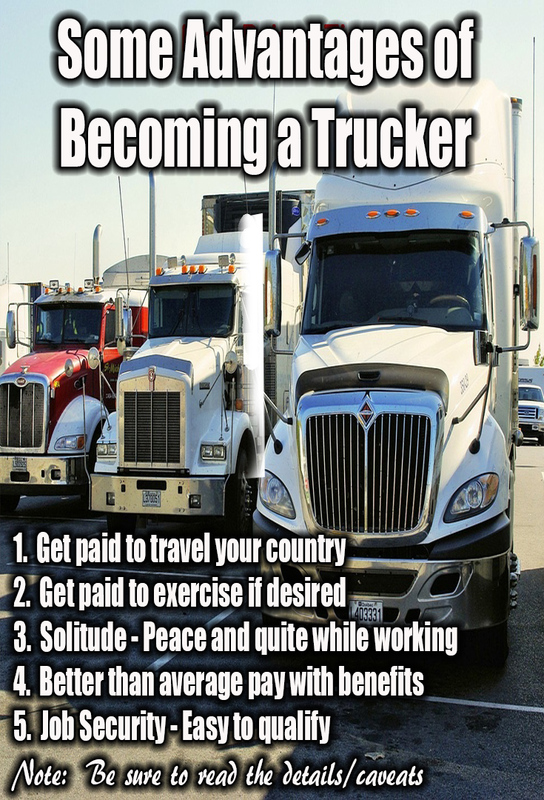 This is for truck drivers who want a trucking job that will help you stay in shape. The peace and quite as an OTR truck driver give you time to reflect and think. Here is what is so wonderful about this type of employment as opposed to regular jobs. Life as a trucker is for the person who loves being with him or herself and don't need a human interaction constantly. If you do need high amount of human interaction to the extent that you hate to be alone, trucking life is not for you. Furthermore, you can create your own environment. I like to listen to personal development CDs. I created my own and you can get a copy. Compared to other entry level jobs and how long it takes to increase your pay, trucking jobs can't be matched. Factory jobs will rarely pay you more than $35,000 after a year. It is possible to start off trucking at $35,000 fairly easily. In a year $45,000 is fairly easy. To get a trucking job you don't need a degree. You need a Class A CDL. This can take 1 to 3 months depending on the method you choose to get your CDL. Although the employment rate is up, it is still easy for something to cause a disruption in employment. A local manufacturer that I that I am familiar with up the street from where I live, hires a lot of people in October and typically in February begins to lay people off. This type of thing doesn't happen in trucking. I know there is some talk about autonomous trucks. Lol. Yeah. Well I an sure they will at some point have some of those on the road going from city to city on the highway, I don't see there not being a driver at all in the truck. There will always be drivers needed. Currently and for the next 20yrs, you can get a great trucking job and not have to worry about getting laid off except on rare occasion at under performing trucking companies. The better the trucking company, the more benefits it typically has. You might guess the benefits vary greatly from trucking company to trucking company. The better the company the more benefits it has. Here are some standard benefits that you can expect at trucking companies.. Smaller niche companies might also have higher benefits and lower pay or higher pay with lower benefits. You have to check and ask questions. 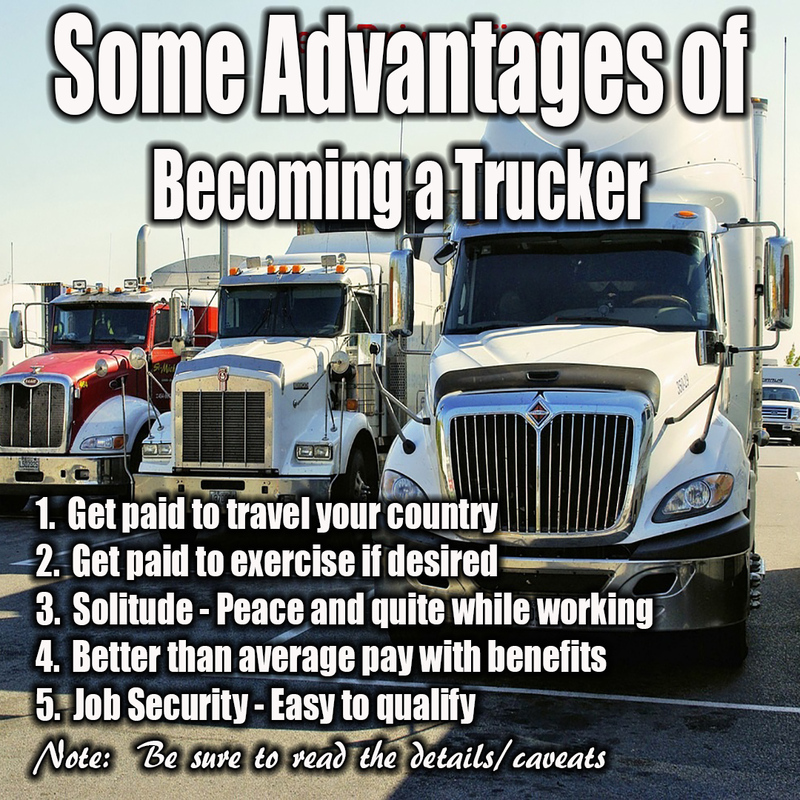 To realize most of these advantages that trucking offer you have to handle job the right way to make trucking a successful career. You need the right attitude and perform in a professional manner. By doing that you will be able to get the best types of trucking jobs. I will describe you to here how to be the type of professional trucker that can go to the best trucking company and get the best trucking job. Comment Below - What do you see that you might light the most about trucking and what questions to you have?